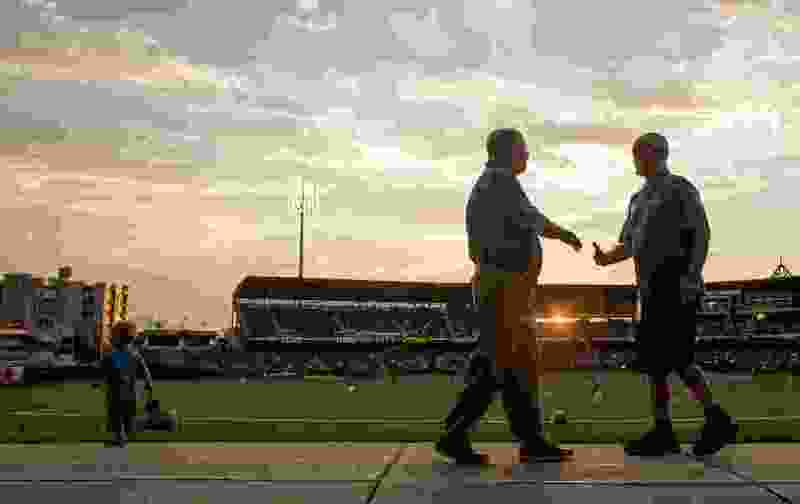 (Leah Hogsten | The Salt Lake Tribune) Salt Lake Bees general manager Marc Amicone, left, can be seen most game nights greeting fans at the ballpark. Marc Amicone pieced together a minor-league hockey team that won a championship, and the opposing owner was not pleased. The description was fairly accurate then and now. Amicone, a former baseball player for Granger High School and the University of Utah, is the vice president/general manager of the Salt Lake Bees. Yet his sports management career started in hockey, with a college internship that turned into a nine-year stay with the Salt Lake Golden Eagles. In his early 20s, Amicone made a lasting impression on his co-workers. Mark Kelly remembers a colleague who “flew right by me” in the sports business. And he’s the same guy as ever, someone “who did a lot of listening and not a lot of talking,” Kelly said. As an intern, Amicone was featured in the Eagles’ 1980 highlight video, carrying champagne into the locker room as the team celebrated a Central Hockey League championship. Amicone worked in an era when the Eagles’ following was comparable to the Utah Jazz’s in the Salt Lake Valley, as strange as that seems now. In those days, “We were really the big dog in town,” Amicone said. Then came the triumphant day when an engineering firm near Decker Lake bought 20 tickets, launching Amicone toward an eventual promotion to general manager during a tenure that included the usual adventures of minor-league sports. • Marc Amicone has worked in three sports operations in Salt Lake City for 38 years, with each job stemming from his baseball or fastpitch softball playing days. After his University of Utah baseball career ended, he played for the Yates Industrial Park softball team, managed by Salt Lake Golden Eagles general manager Chuck Schell. That connection led to Amicone joining the Eagles as an intern in 1979. • In 1975, after Amicone graduated from Granger High School, Chris Hill had become Granger’s basketball coach and worked with Kent Norris, who was Amicone’s baseball coach. Soon after Hill became the University of Utah’s athletic director in 1987, he hired Amicone in a marketing role. • Amicone spent 16 years at Utah, then Larry H. Miller — his former softball teammate with Engh Floral — bought Salt Lake’s Triple-A baseball franchise and hired him as general manager in 2005. In a strategy to distribute commemorative pucks, staff members once placed stickers on selected seats in the Salt Palace, only to have kids figure out the scheme and grab all the stickers. Amicone secured a Larry H. Miller Toyota sponsorship of a fans’ puck shoot between periods for the use of a car. The contest required a shot from the opposite blue line (140 feet away) into a hole barely bigger than the puck. One fan succeeded, and Tony Divino, the dealership’s operations manager, attended a game a few weeks later to award the prize. That night, with Divino watching, another fan hit the shot. “And it never happened again, ever,” Amicone said. The Eagles’ attendance peak came in 1981-82, when they averaged 6,927 fans as the Central Hockey League’s two-time defending champions. The Jazz, a losing NBA team in their third season in town, drew 7,665 fans. Hockey fans were loyal, and Teece’s operation, though understaffed, was successful. “Everyone wanted to do well, for Art’s sake,” said Chuck Schell, the general manager who hired Amicone. The CHL folded in 1984, and joining the International Hockey League, based in the East, meant the Eagles would subsidize opponents’ travel. The franchise never really recovered financially. Yet the Eagles won two IHL championships, including the 1987 title over Muskegon with a roster partly stocked by the NHL’s Calgary Flames and partly by coach Wayne Thomas, with Amicone managing the player payroll and negotiating deals. 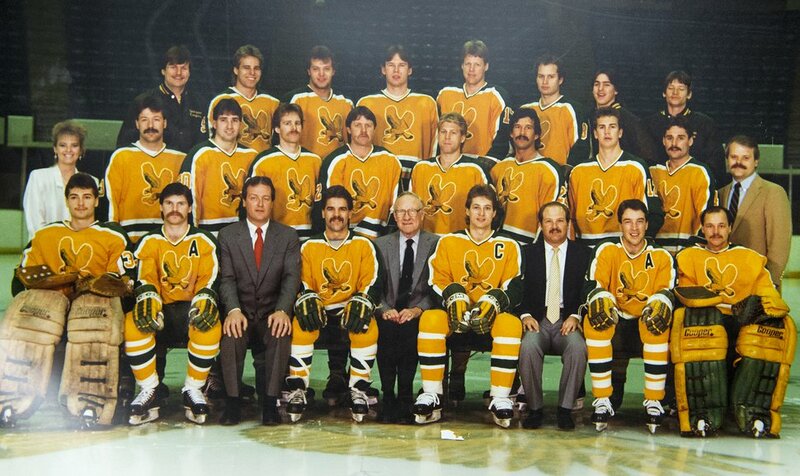 (Leah Hogsten | The Salt Lake Tribune) Salt Lake Bees general manager Marc Amicone is pictured in 1986 with the Salt Lake Golden Eagles hockey team. Amicone is the third person from the right in the front row. He learned to how to market the team with a billboard here or there and a strategy of hoping people would come. The Eagles’ attendance dropped off markedly in the new league, as interest in the Jazz surged in the late ’80s, and the hockey team struggled to stay in business. The Eagles kept winning. But contrary to Teece’s longheld belief, success in the rink or ballpark doesn’t always drive attendance in minor-league sports. When he moved to the University of Utah athletic department in 1988, Amicone had four championship rings and was a two-time IHL executive of the year. Amicone had a tough time telling Teece he was leaving the Eagles, even though he always wanted to work for the University of Utah and got his chance shortly after Chris Hill became the Utes’ athletic director in 1987. Teece sold the Eagles to Larry H. Miller in 1989, and Miller sold the team to a Detroit group five years later. Amicone returned to pro sports in 2005 when Miller bought the Salt Lake baseball franchise. In 2015, the Bees received the Baseball America Bob Freitas Award as the top Triple-A franchise. All that’s missing from Amicone’s baseball career is the part he really can’t control as a minor-league operator – winning a league championship. The Bees are in the PCL race this summer, though, so Amicone may become part of another title celebration in September. “First Jobs” is an occasion series detailing an early segment in the careers of notable Utah sports figures. Today: Marc Amicone, vice president/general manager, Salt Lake Bees.